You can also download our Fire Alarm Calculation Tool here. This is a very important measurement as it allows us to properly calculate the necessary candela power needed for a given space. If you do not have NFPA 72 2013 edition tables 18.5.5.4.1(a) and 18.5.4.4.1(b) handy or memorized, this formula will save the day! Now take the square root of 2000 to get a spacing of = 44.72136 feet. If you consult NFPA 72 2013 tables 18.5.5.4.1(a) it shows a spacing of 45 x 45 feet and table 18.5.5.4.1(b) shows a spacing of 44 x 44 feet. Step #2: Determine the to and from distance of the notification appliance circuit (NAC). For this example, we will saw the NAC is 450 feet. We have to double this distance to account for both conductors. 450 feet x 2 = 900 feet. Step #3: Now that we know the distance, we need to know what type of conductor we are using for the circuit. For this example we will use a #12 AWG solid coated copper conductor. Once this is determined, we will need to consult the Conductor Properties table 8 in the National Electrical Code or NEC 2011 (click the link to view a copy of the table). This table can also be found in chapter 9 on page 721. On the table, located the section at the top under coated. Now follow the line down under ohm/kFT (ohms per 1000 feet). Keep scrolling down until you reach the 12 AWG with a quantity of 1 since it is solid. If you line the left and top rows up, you will see a resistance of 2.01 ohms for 1000 feet of conductor. Step #4: Since we do not have a distance of 1000 feet for a out circuit, we will need to break down this resistance according to our actual distance of 900 feet. To do this simply divide 900 feet by 1000 feet sown as 900/1000 = 0.9. Now multiply your resistance per 1000 feet (2.01) by your distance breakdown of 0.9. 2.01 X 0.9 = 1.809 ohms per 900 feet. Step #5: To determine the voltage at the end of the notification appliance circuit we need to use Ohm's Law. 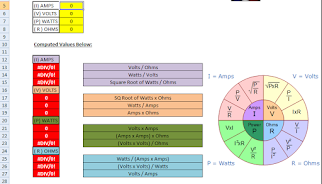 Since we know know the total amps (0.2A) and the total resistance (1.809) we can now find the voltage. I X R = E or Amps x Resistance = Voltage. 0.2 x 1.809 = 0.3618 volts. Step #6: To find the voltage drop subtract your answer found in step #5 (0.3618) from the starting voltage of 24 volts. 24 - 0.3618 = 23.6382 volts. 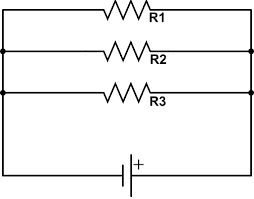 If you come across multiple resistors in series with each other, simply add the resistor values. If there is a common denominator for the bottom numbers use it by multiplying up both the top and bottom numbers in the fraction. Example: the common denominator is 800. Now add the top numbers together (4 + 2 + 1 = 7) and place it on top of 800 like this 7/800. Now take the reciprocal to make the fraction reverse to 800/7. Divide 800 by 7 to get your answer of = 114.286k. Multiply the total of above by a safety factor of 1.2. This gives you a 20% spare buffer. Round up to required battery amp hour size. Every time you double the distance from the audible appliance, you loose 6 dB. Example: If you have a speaker with 75dB at 10 feet, you will have 69dB at 20 feet and 63dB at 40 feet and so on at 80 feet, 160 feet...... Please note, these are not multiples of 10 feet!!! These are broken down by doubling the distance from the last measurement. If you double the power output of the appliance, you gain 3dB. Example: If you have a speaker tapped at a 1/4 watt with 75dB and you double the wattage to 1/2 watt, you will then have 78dB.